The stigmatising narratives which dominate popular discourse on the 2011 riots have imbued the punitive regeneration of Tottenham with a political and moral urgency. Soaring house prices, a lack of social housing, and an increasingly expensive and insecure private rented sector, alongside cuts to housing benefit, are contributing to a situation in which London is increasingly unaffordable to much of the population. Touted as a ‘solution’ to the housing crisis by some, regeneration projects have been linked by others to broader processes of gentrification, understood as a class-based reorganisation of the city and displacement of its poorer residents. A recent talk by Tom Slater at the LSE elaborated on the crucial relationship between popular imaginations of place and processes of gentrification. Describing the ‘regeneration’ of Edinburgh’s Craigmillar estate, Tom showed how territorial stigmatisation – Loïc Wacquant’s term for the process of denigration of an area and its residents – has worked as symbolic justification for a broadly class-based reorganisation of urban space. Stigmatising narratives have run through popular representations of Craigmillar, but can also be seen in the language used by public and private agencies responsible for ‘redevelopment’. This got me thinking about the patterns of stigmatisation that have been used to normalise rapid projects of ‘regeneration’ in London in the wake of the riots of 2011. This article points to some of the ways in which the images and discourses around the riots have fed into stigmatising narratives that have underpinned projects of gentrification in areas of the capital marked by association with violence and criminality. Gentrification has been in full swing in neighbourhoods like Brixton and Hackney since long before the most recent bout of urban ‘unrest’. Indeed, increasingly obvious economic and social inequality, and the securitisation of public space (manifested in policing practices like ‘stop and search’) provide important context for understanding the riots. However, the riots themselves – or, more particularly, the dominant narratives around the riots – have fed into projects of urban redevelopment, imbuing them with political and moral legitimacy and urgency. Much has been written about the systematic demonisation and delegitimisation of ‘the rioters’ in political rhetoric and by the mainstream media. The unrest was widely dismissed as utterly meaningless and apolitical – ‘criminality pure and simple’, as Cameron famously put it – and those involved were accordingly framed as greedy, immoral individuals. The riots were treated primarily as a law-and-order issue, rather than a political protest, obscuring the structural and systemic inequalities at the root of the unrest. This representation set the scene for the incredibly severe criminal justice response to the riots, and in the longer term has served to naturalise punitive shifts in welfare policy: see, for example, Ian Duncan Smith’s conference speech citing the riots as ‘evidence’ of a need to tackle a ‘growing underclass’ through benefits reform. These narratives have cropped up again in discussions around the ‘regeneration’ of riot-affected areas, perhaps most notably in Tottenham. Symbolically linked to a history of rioting, both in 1985 and 2011, Tottenham has – in the public imagination at least – been broadly left out of the patterns of regeneration that have shaped areas like Brixton and Hackney in recent decades. Yet in direct response to the riots, the Mayor’s Fund promised £70m to regenerate areas damaged by the riots, with Tottenham and Croydon being the major areas of focus (though it is unclear how much of this promised money has actually been paid out). Haringey Council’s Plan for Tottenham sets out their project to ‘build back a better Tottenham after the riots which devastated our community’, while the Mayor of London’s Independent Panel On Tottenham reported that regeneration was crucial to prevent future riots. Boris Johnson at the launch of the "It took another riot" report on Tottenham's regeneration. Matthew Aslett/Demotix. Few would argue against genuine and equitable improvements to infrastructure, housing, and services in Tottenham, but the Plan for Tottenham has caused much concern, particularly in relation to its explicit intentions to increase local rents and property prices, and to change the demographic make up of the area along what some see as racial or ethnic lines. The link between riots and regeneration, as made by the Mayor’s Panel and elaborated in the Plan for Tottenham, has drawn on some pretty contentious assumptions. Boris Johnson has said the regeneration is ‘not simply about repairing the damage from mindless violence but turning around the ship of long term unaddressed decline’. The Mayor’s Panel has emphasised the importance of transforming a physical environment which has fostered ‘cultures of poverty and low aspiration’, and of dealing with ‘troubled’ – or, more stigmatising still – ‘problem’ families. Tottenham’s ‘problems’ have been blamed squarely on the riots and rioters, rather than on the long history of economic inequality and political injustice in the area. As a result of the riots, a Telegraph article claimed, ‘a poor area has now got even poorer. Tottenham's commercial heart has been ripped out, its reputation shredded’. As with the more immediate rhetorical and punitive responses to the riots, this logic draws on the assumption that individual and ‘cultural’ factors, rather than structural inequalities, are the priority. Equally alarming is the trope of ‘vitality’ in rhetoric around redevelopment. 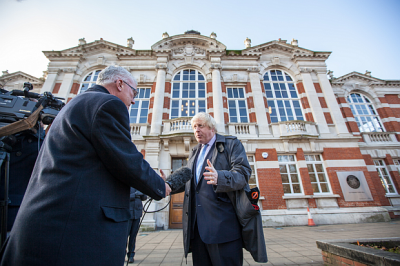 Eric Pickles said the Mayor’s investment would ‘breathe new life into both Tottenham’, while references to ‘rejuvenation’ and ‘revitalisation’ are rife throughout the literature. This language is highly stigmatising, creating images of the existing area as stagnant, lifeless, dying or dead. In fact, many accounts of ‘regeneration’ suggest quite the opposite: that the displacement and scattering of working class communities by gentrification causes grief, loss and atomisation. Though the council has promised no loss of social housing, most of the social housing available will take the form of homes for ‘Affordable’ and ‘Intermediate’ rent – that is, with rents at up to 80% of market levels – far higher than council rents, and with less secure tenancies. With the great majority of new housing in Tottenham set to be for private market rent, near private market rent, private sale or shared ownership, ‘regeneration’ in Tottenham looks set to cause considerable displacement of poorer residents. In the summer of 2011, the riots were broadly framed as antithetical to ‘community’, and the linking of ‘regeneration’ to the riots continues to draw on the assumption that community should be defined in opposition to the riots and rioters. The riots have provided a useful reference point for the stigmatisation of areas and residents that has underpinned regeneration projects, but it is crucial to ask what kinds of communities can be created by policies that encourage rising prices and city investment. Moreover, it is interesting to see how new developments in Tottenham sell themselves not on ideas of community, but on values of privacy, seclusion, and security: a new development from Newlon boasts it is ‘hidden away from the hustle and bustle of Tottenham High Road’, offering an ‘escape from city life’. Some residents of riot-affected Tottenham have argued that they are ‘being collectively punished for [the riots] by gentrification’. The notion of gentrification as punishment is informative, drawing to mind Wacquant’s work on neoliberal government and ‘free market’ economics as a means of ‘punishing the poor’. Certainly, projects like Heygate was Home show how ‘regeneration’ projects around the capital have systemically displaced long-term residents who cannot afford to live in their neighbourhoods once regeneration begins.